This post is Part 7 of a series to augment the Atlas of the Known World available for free download. Start with Part 1 here. Roof of the world and home of the elves. You voted The D'jed Mountains winner of May 2015 by 93%. 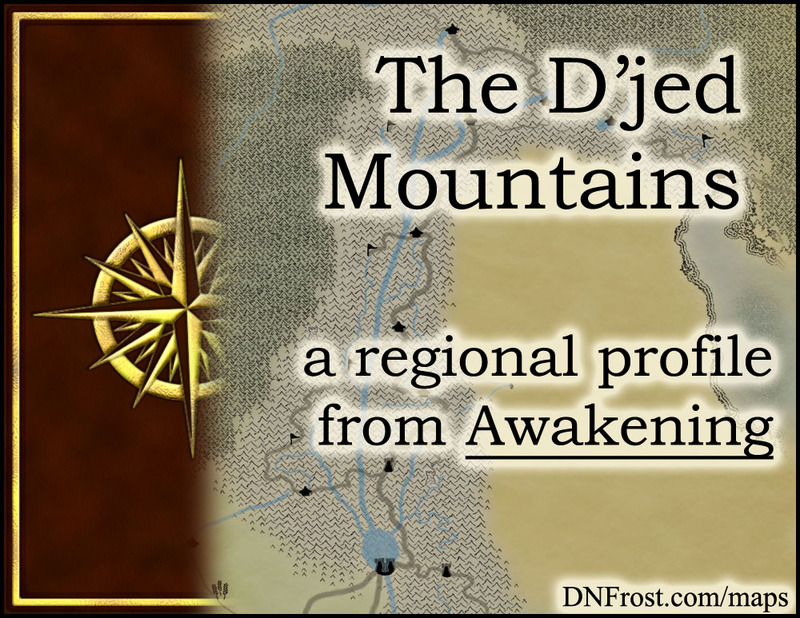 In Chapter 5 of Awakening, the D'jed Mountains form the spine of Allana, dividing the Kalrein Forests of the west from the Sutek Desert of the east. The mountain range bends eastward from the Draconan Mountains to form The Guard, a minor range separating the Sutek from the Glavi Forest to the north. The highest altitudes in the Known World are found within the D'jed, and its tallest peaks are snowy year-round. After the spring meltwater retreats down the River Tang, the valleys of the D'jed bloom with life. This region also borders the Front Rishi and the Back Rishi, of the Plains of Rishi. The hardy meadows of the D'jed feed a number of animals specially adapted for the high mountain elevations. Insects swarm the valleys in spring and summer, and gray eagles soar in the thin air between mountain peaks, hunting smaller birds and blackfoot hares. Silver ibex wander the rocky slopes above the treeline, where the top predator is the great snow leopard, an elusive cat rarely seen by denizens. Wild dragons nest in the rocky reaches of the high mountains, but even these masters of flight avoid the tallest ridges. 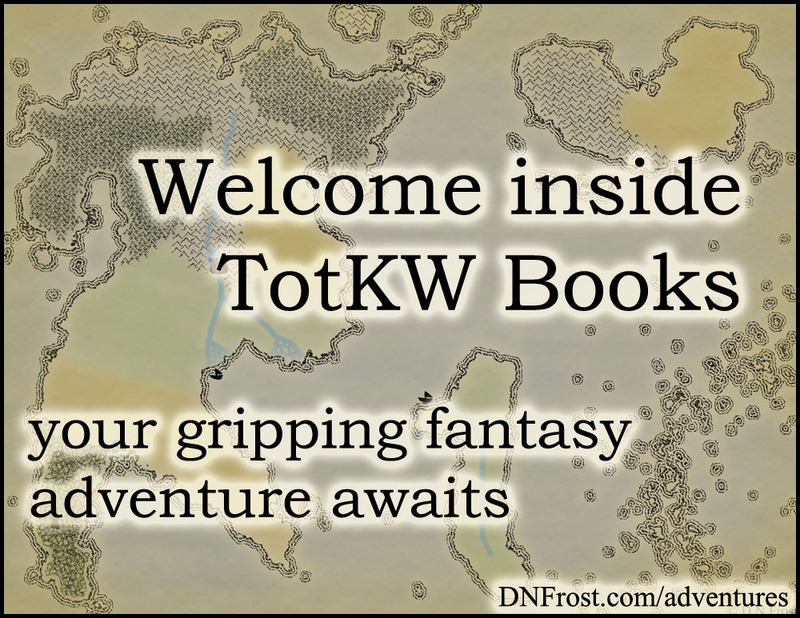 Like most elves, the people of the D'jed are tall and willowy, with dark hair and eyes. However, their pale skin and short pointed ears distinguish them from other elf races. Due to a long-standing blood-feud with the faeries of Kalrein to the west, many towns along the western Blade and Cleft of the D'jed pay bounty for the severed right ear of a faerie. Mountain elves dress simply in warm furs and hide moccasins, though in summer the men wear lighter linen robes, and the women don thin woven dresses dyed bright colors. Special magic is the most prominent elf ability, and mountain elves are renowned for their metal magic, with traces of latent animal magic as well. The elves of the D'jed are famous for their blades, which are mined, smelted, and forged with their metal magic. Though their elemental powers are fairly weak, the mountain elves are the strongest elemental mages of all the elf races. Their earth magic is decent, and their latent air magic is rather poor. With barely detectable sound and touch magics, mountain elves make the worst sensory mages of all the elves. The mountain elves of the D'jed value piety and loyalty as the highest virtues. Religious faith and magic are a huge part of daily life, especially for blacksmiths and other skilled trades. Silver and gray are the colors of magic, and the mountains are seen as holy gifts from the deity Mother, full of precious metals to be mined and smelted. Caves are viewed as sacred entrances into these mountains, and temples are often built at the mouths of caves. As the ancestral homeland of all elves, the D'jed is the oldest territory of the Allanic Empire, and the mountain elves make loyal citizens. Families are tight-knit and often live together in large dwellings that house adult siblings, their spouses and children, as well as grandparents and great-grandparents. Generally even-keeled, the mountain elves pay little mind to the behavior of others, but grow incensed at the mention of Kalreini faeries or the blood-feud between their clans. Age is measured in years, with the new year falling on the winter solstice of the ancient mer calendar, which the empire adopted long ago. Adulthood is reached through expertise rather than age, and girls are considered women once they experience first blood. Boys come of age when they prove themselves in a skilled trade, usually as a blacksmith, though the more remote villages will find a successful hunt sufficient. Adults are expected to contribute to their family unit, which entails consistent use of their proven skills to generate income, as well as taking a spouse and producing children to assist with household tasks. A warrior infantry patrols the western border of the D'jed against the Kalreini faeries with whom they feud. These warriors are outside the regular system of mountain life, and they have little contact with the rest of the mountain elves. Children with strong combat skills are encouraged to hone their abilities, and upon coming of age, they may choose to journey westward to join one of the border garrisons. There, they serve to guard and protect the D'jed from the bloodthirsty faeries until the day they die. Older warriors often refrain from active patrol, instead training the newest arrivals to prepare them for skirmishes. The ancestral elvish tongue of Ka'e is only spoken in the most remote villages of the D'jed. Modern elves view it as archaic, and their language has been replaced by Allanic, the official tongue of the empire. However, the Allanic Empire retained the Ka'e alphabet as its official writing system. The angular runes of Ka'e have expanded to include symbols for Allanic sounds absent in the old elvish tongue. Mountain Allanic sounds a bit more formal than the dialect of the plains elves, with a stricter grammar and less gesticulation than their cousins to the south. In the book Awakening, the plains elf Kingard resides in an ancient temple deep within the sacred mountains of the D'jed. A legendary hero from centuries past, Kingard whiles away his immortality in a derelict cavern, awaiting the dark time when he will need to save Allana again. 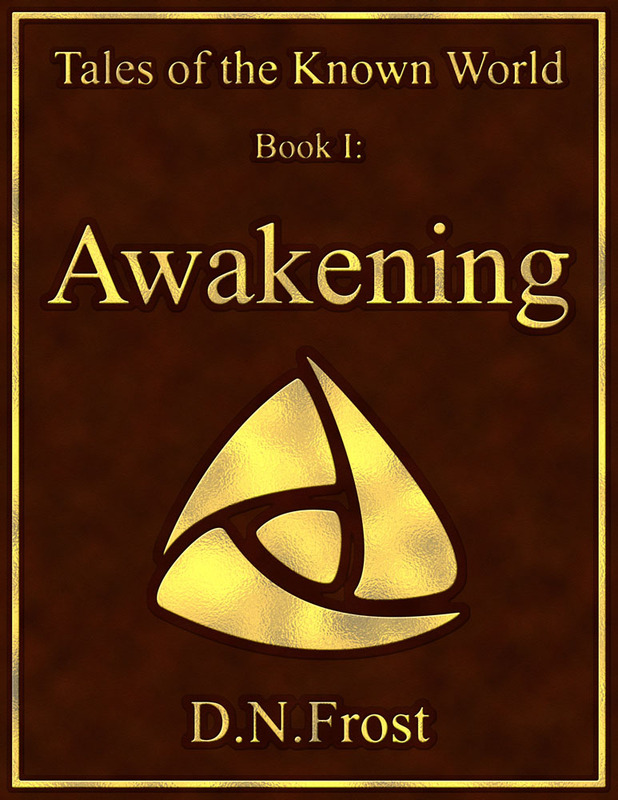 His call to action launches a race to save a young shape-shifter from imperial forces. Kingard guides the innocent fugitive through the heart of the empire to quest for a distant glade. Only there can he unleash the power of the magic city A'lara to save the land from evil.